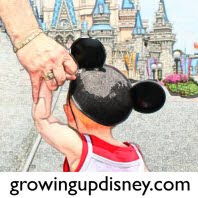 Welcome to those of you joining me from A Disney Mom's Thoughts and those of you just hopping aboard. I am the 5th stop on our Magical Blogorail. Only 206 days to go until I take off running into the night with thousands and thousands of my new best friends. Ok, thousands and thousands of strangers and a few online friends that I can't wait to meet. What is this event? 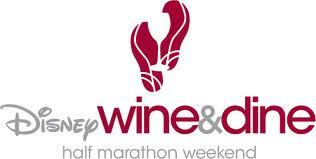 It's the 2012 Disney Wine and Dine Half Marathon on November 10, 2012 beginning at 10:00 PM. Huh? A night race? Well, that's a new one for me. Run 13.1 miles around Walt Disney World in the middle of the night and finish with an after-party in Epcot on the last day of the Food and Wine Festival. This has promise. 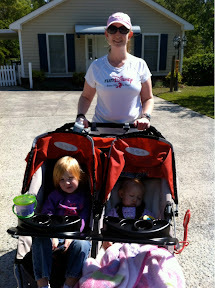 This isn't my first half-marthon or Disney race but it will be my first of both after having my gorgeous girls. In years past, I ran the precursors to the current Wine & Dine event. 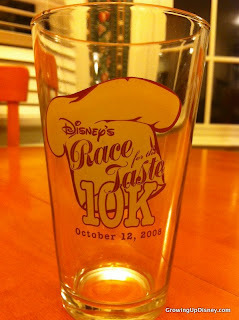 During our fall vacation in 2004, I ran the Disney 10k Classic and a Race for the Cure 5k during one weekend. The 10k course was essentially the last 6.2 miles of the full marathon, covering Wide World of Sports, the Studios, the Boardwalk Area, and finishing through World Showcase at Epcot. We moved from Alabama to Oklahoma in October of 2005, but I was back to run again in the fall of 2006. Now the event was called the Race for the Taste 10k and was tied to the Food and Wine Festival. We were given wristbands with tabs that acted as tickets for food items at the finish line area. I ran this alone and no one came to see me at the finish line (at the time, I was running races all the time, so my family didn't feel the need to wait around on me.) The lines were insane so I passed on the food and walked back over to the Epcot bus stop to catch a ride back to Old Key West. I still love the swag from that race. Instead of a(nother) t-shirt, we were given lunch bags and matching water bottles emblazoned with the event logo. I used them for work for years and still have the insulated bag handy. 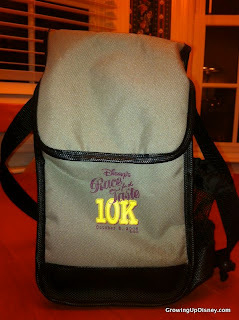 Two years ago, the Race for the Taste 10k became the Wine and Dine Half Marathon Weekend as Disney goes toward more and larger races throughout the year. The 10k distance is not included in the new event but a 5k and kids races are a part of the weekend's activities. Some people have attempted to run the 5k (7:00 am) and the half (10:00 pm) in the same day but that's just too much loss of sleep for me, especially since I will have my then 17 month old and 3.5 year old daughters along on that trip. When I told my husband that he could buy a ticket for the late night party, he gave me this look that said, "can't you hang out with some of your friends? I'd prefer to sleep." And I don't blame him. I am questioning the sanity of this idea, but with 4 other adults in our travel party, I should be able to sneak in a nap and some strong coffee. I've recently met a new running buddy in my new town in North Carolina and I'm so excited that she is training for a half-marathon on the same weekend. It's too bad that we can't run the races together but how nice for training schedules to line up. She's also a mom of two young children so we're both flexible to working around ever-changing schedules. I'm glad to be running again but I am having a hard time settling into a routine. I'm beginning to think I may not have a "normal" schedule again for years so I'll just have to jump in and do the best I can. Two babies born 25 months apart, an insane 2011 and returning bad habits have set me back weight-wise. But as my husband likes to say, "this ain't my first rodeo." I became a runner at first out of a sheer desire for efficiency. I was working out at lunch and I could burn more calories in the time I had by going faster. It was simple math that over time resulted in a loss of more than 80 pounds. My very first race was a Race for the Cure 5k in Birmingham, Alabama. There is something addictive about crossing a finish line and I went from there to a 10k about six weeks later, a half marathon the next spring and a full marathon in the winter. Of course, my first full marathon had to be at Walt Disney World. Over the years, I've run races of all lengths in a bunch of different places and Disney puts on some of the best with great organization and fun pre- and mid-race entertainment. The ultimate runDisney swag. My Mickey medal for the full marathon. That's me and my Alabama running buddy, Andrew, in 2005. 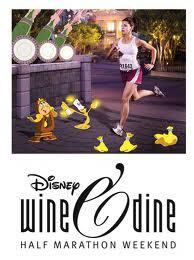 So now I am training for the Disney Wine and Dine Half Marathon and I need to lose some weight along the way. This time, while I'd love to look cuter, I'm more concerned with being healthy and full of energy to keep up with my two young children. And as I read on a t-shirt recently, "The more I run, the less I want to run away." I'm logging my miles through Daily Mile and there is a widget on the left column listing my mileage if you'd like to run along. For all the details from Run Disney, here is a link to the official event site. Are you going to be running the Wine and Dine Half Marathon or attending the party as a guest? I'd love to hear from you. Good luck with Wine and Dine! I'll be back to Daily Mile in.. somewhere around 6 weeks! Great post Amy!! I am in awe of all of you runners!! I will be there! I was part of the inaugural and plan to continue until I'm dead or they cancel it. We are planning on heading to WDW in the fall of 2013, and I think I've finally convinced my husband that we should give the 2013 F&W half marathon a shot! That way we have plenty of time to get our butts into shape! !